Holy Communion is one of two sacraments for Lutherans (the other being Baptism). In Holy Communion we are fed with the Body and Blood of Christ. St. John celebrates Holy Communion on the first and third Sundays of the month and each worship service. We invite everyone, of all denominations, who believe that Christ is truly present in the bread and wine of Holy Communion to join us at the Lord’s Table. We serve wafers and wine during communion. 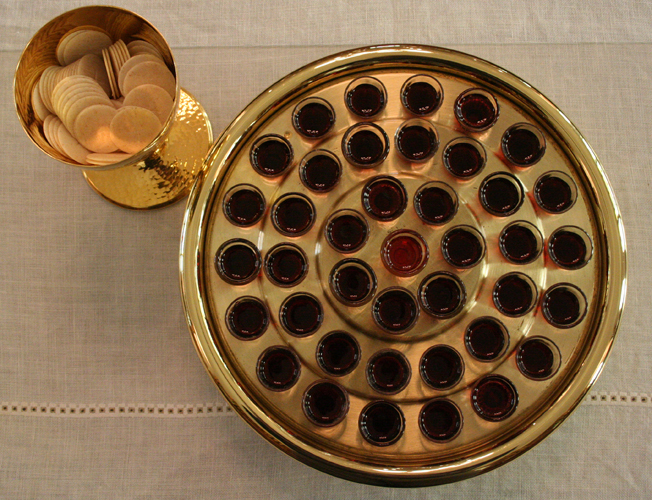 Gluten-free wafers are available on the organ side, if preferred.If, for any reason you wish to receive grape juice instead of wine, the middle glass of each tray is grape juice. We hold Holy Communion classes for our 5th grade students to teach them about the sacraments and to prepare them to receive their first holy communion. Classes are held during the Sunday School hour in the month prior to the beginning of Lent. These students, alongside their family, take their first communion on Ash Wednesday each year.